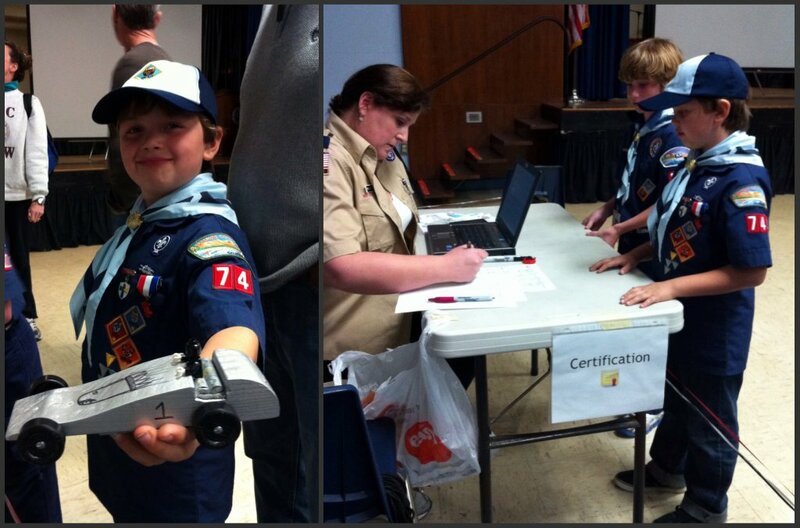 For those of you who have sons in Cub Scouts, you know that the annual Pinewood Derby is serious business. Not just for the kids, but for the parents (mostly the Dads) - because the parents are usually the ones doing most of the wood cutting and sanding. Sure, the kids paint the cars and help, but really how much can a 7 or 8 year old do with saw? Well, at least safely. This year was Dylan's third year racing in a Pinewood Derby. He has yet to win. And I found out that this was my Dad's 21st pinewood derby car to help make. Being an Eagle Scout, he has raced his own cars as well as those of his sons, and now his grandson. I stay out of it because it's just too much pressure to have the perfect car. The perfect weight. The perfect wheels. In my head I'm thinking 'people, it's a piece of wood' - but I know better than to say this out loud around the guys. I may be a girl, but I'm not stupid! Dylan named his car the Silver Bullet. He drew his own bullet on the car and decided to put a driver in the car. What kind of driver do you put in a pinewood derby car? A LEGO driver of course! Each car races in four heats, a different lane each time. This keeps it fair in case one lane happens to be slower than another. The car who wins the most heats will win for that level of Cub Scouts. Dylan's Silver Bullet won 3 out 4 heats. Proud day in our household and proud day for Grandpa. After building and racing in 21 Pinewood Derby's, this is only the second time he has stood in the winners circle. So happy and proud of my little guy. We had to go out and celebrate. He didn't want to leave his car or trophy in the car, so we brought them with us. I think he secretly wanted people to ask him about the trophy - and that's totally fine with me. he deserved a little recognition and praise. After all, he just won the Pinewood Derby!